Within a great many successes and failures, I sometimes find solace by reflecting on all that I’ve experienced. I may not have recognized their impact in the moment, but I can certainly appreciate them with distance. Such is the tale of my visit to see my mentor, friend, and teacher, Arthur McDonald, as he celebrated a storied career and honorable retirement. This story, however, is something I’ve been trying to write for over three years now - and it’s not for lack of trying. I’ve probably written three full drafts at one point or another. I would sometimes stare at the pages before me, cognizant that something was missing, unable to find solve the puzzle. I didn’t recognize, no, I couldn’t recognize the profound impact Art had on my life until recently. Every time I put pen to paper, I could only recall the details of what happened. I didn’t understand how intrinsically the effect was imprinted upon me - the waterfall it created in its wake. One snowy day in December 2015, I ventured to Syracuse, NY to see my old friend and mentor, Arthur McDonald. Retiring after the Fall ‘15 Semester, Professor McDonald spent over 40 years teaching at the Syracuse University School of Architecture. In that time, he was widely known as invaluable source of inspiration to the University, fellow faculty, and his students - myself included. As a way of formally paying homage to his own career, he and other faculty members built an exhibition to showcase his professional work. The gallery he titled, Plan Games: Disciplinary Rules and Circumstantial Plays, was a clear representation of both his methodology and care for architectural practice. My visit started with a personal tour of the exhibit that afternoon at Slocum Hall, home to the SU School of Architecture. 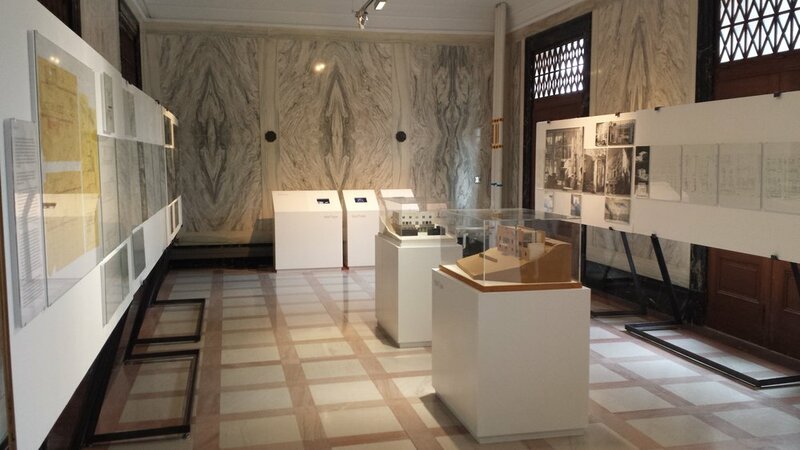 The gallery had been set up in the Marble Room, a space well-known throughout the school and University for its monolithic walls of green marble cladding - full slabs spanning floor to ceiling. As I entered from the south end of the room, I was greeted by three large, white stands. The first a pedestal with handouts for the exhibit. The next displayed a descriptions of the gallery work and a brief synopsis of Art McDonald's prestigious career. 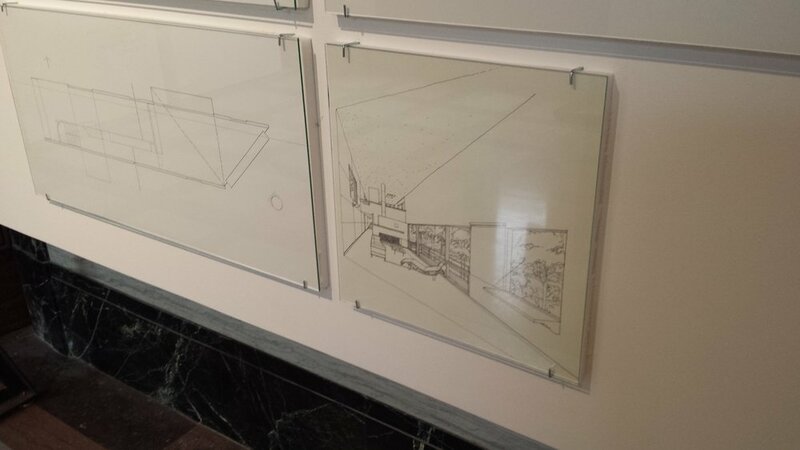 The third presented six projects, each with a series of diagrams that lead the observer to a single floor plan. After a moment, my eyes adjusted and began to wander. The space was lean and rectangular in shape. There were two, long white display walls set up to accentuate the length of the room. Each board showcased a single project (of the original six near the entrance) from initial sketches through final built work. Each drawing was meticulous. Every model a work of art. The gallery was truly something to behold. After pacing the room for a few minutes, I saw a tall, slender figure walking towards the Marble Room out of the corner of my eye. We greeted each other and he immediately asked how I was doing, what I was up to lately - as though no time had passed since I last saw him. Years of distance melted into moments. We left the gallery and walked through the halls of Slocum to find ourselves at his office on the third floor. We talked for over an hour about this and that, reminiscing a bit on the time I had spent at the school years prior, where I had gone since, and where I wanted to go in the future. Side Note - I don’t know why people lose touch, but it’s amazing how easily you can start up a conversation with someone as though no time passed at all. The time flew by as we chatted about my wife Jessica, Art’s family, architecture, the school and everything in between. As the afternoon spilled into early evening, we said our goodbyes and I made my way back to the gallery. I needed to look one last time, as though some invisible force was pulling me, guiding me back to the room of marble. As I walked through the gallery of his life, I uncovered the nuances of the craft Art had cultivated over several decades. With each deftly drawn sketch, I saw another layer reveal itself. I had always revered the inspiration Art had been to me, but I had never seen or been able to appreciate so much of his work in one place at one time. Every drawing had been carefully curated as though it was part of a permanent collection new students would revere as they embarked on their first days of Architecture School. Maybe it was the history of the room, but something just felt right about it all. Laid bare for the community was the representation of one man’s life. Perhaps it didn’t showcase everything. Certainly there were no family photos, no letters kept, no gifts from friends - but rather the gallery had become a humble distillation of everything important to this Architect’s professional career. Now, look - I’m obviously a bit biased. Art was not only my 3rd year studio professor, he was also my Thesis Advisor and one of the most prominent figures in my formative years as an Architect. But THAT, my friends, is the point. It’s the missing ingredient that I failed to recognize. Art was not only the most important mentor of my early career, he was the guiding force that inspired me to inspire others. He had been inspiring others through me for years. I just needed to open my mind and remember. After I graduated from college in 2008, I immediately started working in an Architecture office in Buffalo, NY. Within a matter of months though, I was already starting to receive requests from other students still in school looking for advice on how to get jobs around the city. I remember getting emails from peers I had met who were only a year or two behind me. I even remember how several helped me complete my Thesis project while I was managing to get by on caffeine and a dream. I was happy to help wherever I could. If someone wanted to meet me for lunch or coffee just to talk about how I did something in my own career, I was there. In the early days, I didn’t feel like I had much to offer, but I could tell that I was helping in my own way. After a couple years, I realized that I wanted to make more of a direct impact for emerging professionals and young architects in my community. When the opportunity to join the local AIA Board as an Associate member came my way, I jumped at the chance. Within a few months, I had rebooted the Buffalo Emerging Professionals Committee and advocated diligently to help those in their early career years. There was a subtle shift. I could sense that even though I didn’t have a lot of experience, I had just enough to help guide those before me into their first jobs and over the hurdles of being a young architect. In 2015, I switched jobs for the first time in my career since college. I was immediately propelled into a role with more responsibility, not only for myself, but also for the staff around me. I was in a position of influence and I had the ability to share some real experiences with those who came after me. I had always been confident in myself professionally, but I knew that the years had given me a certain perspective that only comes with age. I worked hard to motivate younger staff and teach them everything I knew. There was no sense in ever keeping it to myself. Lately, I walk around the office and catch someone working on a project. Sometimes they’re in the middle of a detail, putting together a presentation for a client, or building a 3d computer model. I remember when I helped them do all those things. They don’t always take easily to the lessons that you did. They don’t always understand everything you try to teach them. But when they move to other teams and work with other mentors, you can tell that you made a positive, albeit modest impact on who they’ve become. You’ve affected the trajectory of their careers. All you can hope is that they’re better for it, inspired to take what they’ve learned and keep moving the needle forward. Today, I stand before you and realize how fortunate I’ve been to have shaped, if ever so slightly, the trajectory of a few young souls. Inspiration to the next generation is at its most profound when it comes from the purest place within us. I think back to all those who mentored me, who continue to do so, and who stuck by me, in the spirit of learning from their experiences so I could do better than they did. As I write this tale of my visit one snowy, winter day, I realize that Art’s greatest impact wasn’t the immaculate drawings. It wasn’t the clever concepts he molded into buildings. My mentor’s greatest achievement was inspiring me as an Architect to inspire more in the same way. Mentorship is the lifeblood of our profession. It's the best way we have to affect the positive change we seek in the world. It may seem simple enough, but it’s difficult to put into practice consistently. Only a few know how to do it well. Art McDonald is one of those people. I challenge you to be the same for someone else. If you could look back on all of your experiences at the end of your career, what would you want to see? If you could distill your entire professional experience into a single gallery, what would you want others to understand about the creative you were? How would you share your life? Now that you know you can, how will you curate the gallery of your life? How will you inspire those who visit, even if they’re just passing through? There's no reason to wait -- Start your gallery today. Start it right now. You can check out Art’s Exhibition & Gallery Talk, “Plan Games” on YouTube.